All spoke to seemed to have great run. Thanks to the farm for hosting us, the MK Casino for the Goody bags and LightUpU for the spot prizes. We are pleased to announce that following the success of the first stage in the U16s Pilot, we are now taking on 24 more under 16’s beginners. The winner is based on “as the crow flies” – so a straight line – some teams would have done better had they thought about this! We have a winner…a “provisional” top 3 no less…. 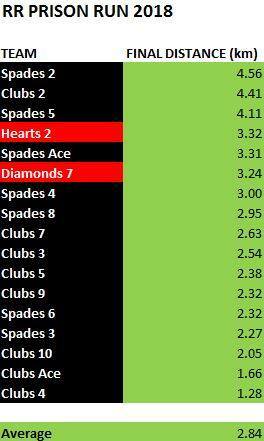 In first place was Team 2 of Spades, led by Richard Minney! They made it all the way to the MK Library, a straight-line distance of 4.56k! In a very close second was Nigel Sheppards Team 2 of Clubs who got to The Old Swan in Bletchley – 4.41k! Well done Nigel, Leigh, Karen and Juliet. So close. And in third was Mikey and Mel who made it 4.11k to the Concrete Cows! Great effort. From Monday 6 August to Friday 10 August 2018 saw the first of The 5 Lakes 5 Evenings Marathon Challenge, led by the clubs Kevin Shepherd. The challenge that we would run 5 evenings around some of the beautiful lakes of MK with the total distance run over the week at least a marathon distance. Aimed primarily at Step Up standard the event was open to any Redway Runners members. With loop backs meant that each person could run to their pace and distance but knowing they would achieve at lest a marathon over the week. Monday evening saw 51 people run from the Furzton pub around the lake and off to the river. Taking in cycle route 51 we covered 7.1k. A really hot sunny evening with the gauge showing 34 degrees centigrade on the journey to the run. Our 2nd run we joined the Explorer group for 8k around The Blue Lagoon lake area. 66 of us again a very warm evening but there was plenty of shade. Wednesday we transformed Woughton Wednesday from Woughton Leisure Centre for 9k around Teardrops and Lodge Lakes. 56 people ran a lovely route that takes in parts of the MK Marathon route. Somehow we managed to miss the downpour of rain. Day 4, 49 of us ran 9k from Caldecotte Lake to Ashland and Mount Farm Lakes. Another beautiful scenic route showing how amazing MK is. Friday night we were joined by the Friday social group and for the grand finale we left Willen lake, ran down the river to Broughton Lake across to the Ouzel river and back up to Willen lake. That was 49 people covering 9.1k. The 5 runs total 42.2km. With the loop backs the distances actually achieved were much higher. Several of the runners graduated from recent Beginners Groups and just shows what can be achieved. There were some sore tired legs (including mine) at the end of the week and we celebrated in the Lakeside pub at Willen Lake Friday evening. Grant ‘Ron’ Mugford, Karen Smith, Susannah Quinn, Sally Green, Jo Fenton, Jacqueline Moore, Jemma Roughley, Leyla Currie, Sally Simmonds, David Betts, Tony Welsh, Steve John Candlin, Carol downs, Alistair Devenish, Kate Sheard, Sophia burgess, Phill Poyner, ali Smitt, Denise Clayden, Karen Fleming, Jonathan Fielden, Sean Butler, Victoria Pepperrell, Carol Glover, Darren Thomas, Julie Thomas, Catherine While, Jon Hunt. We had lots of people that did 1 or a couple of runs. Too many to mention but thank you for being so supportive. Thank you also to the super tail runners Lorraine Devereux, Helen Whalley, Debbie Dickinson and Steve Morris. Also a big thank you to the runners who managed road crossings. Everyone was really supportive of each other. We had a big variation of abilities and the encouragement given amongst the group was amazing. Thank you for being such a great group. An amazing effort by you all. Thank you for making it a really enjoyable week. See you soon and here’s to 2019. Will definitely be doing the event again next year. We are pleased to announce Redway Runners are starting our next free beginners’ groups in September 2018 and we have seven (yes 7) courses starting. They will be working towards doing the free Milton Keynes 5K parkrun at Willen Lake on Saturday 24 November 2018 at 9:00am. If you want a place you need to act quickly as all these courses have limited spaces. This time we again have an extended course, we have a Saturday morning course, also daytime morning and most weekday evenings (except Friday), we have courses from David Lloyd at Newlands, Mercedes at Tongwell, Woughton Leisure Centre at Woughton and Tattenhoe Sports Pavilion so plenty of choice depending on your location. Representatives from Redway Runners presented Milton Keynes Hospital Charity- Cancer Services Department with a cheque for the money raised by Redway Runners in 2017/18 at the annual Beat the Barge running event on Saturday 4th August. £12,293.10 was presented to Charlotte Jelley of MKHC by Mike Webber, with the helping hands of Martin Lawrence (Chairman) and Jonathan Clements (event manager and Redway Runner). The money was raised throughout the year by club members with activities such as a virtual run, Christmas raffle and the Furzton Relay. In addition, several club members raised further money for MKHC by completing running events and challenges. Over the six years that the club has had a Charity of the Year, their runners have raised over £35,000 for local charities. 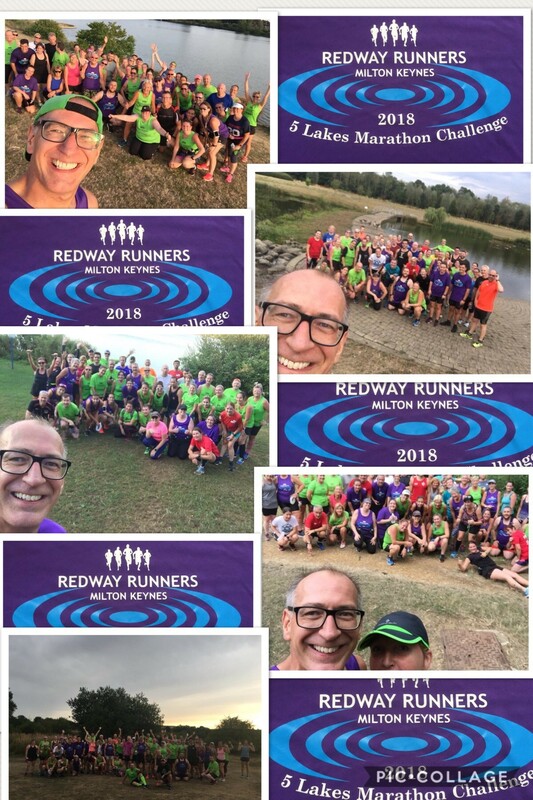 Redway Runners are an inclusive running club with runs daily across Milton Keynes. For more information on joining the club, visit www.redwayrunners.com. With a different runs each day and at lots of different times, there’s something for everyone. Find out more. P.S. Spot the mistake on cheque!